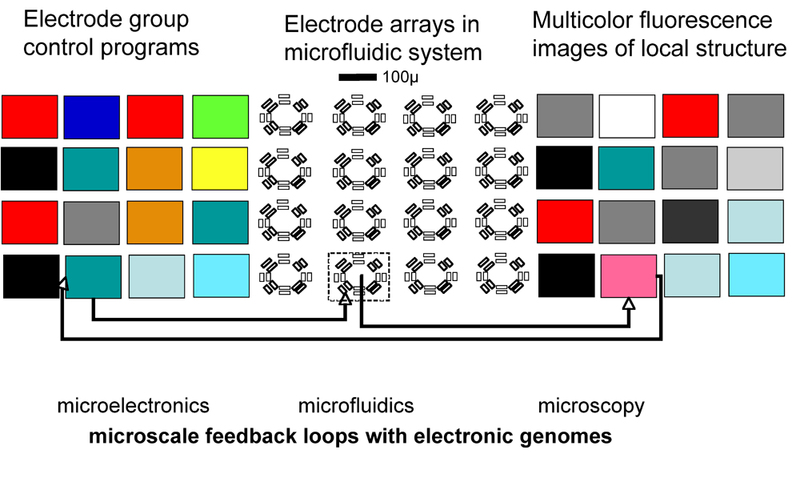 Electronic microfluidic systems are the right tools to aid us in the combinatorial synthesis, functionalization and programming of the first artificial cells. Biological cells are themselves micro- and nanosystems par excellence, with autonomous self-construction (metabolism), self-assembly (containment) and self-reproduction (heredity). Modern electronic systems are optimized with a universal and convenient serial programming interface. When equipped with parallel micro- or nanoscale actuators and sensors, electronic programmability can become an integral part of a complex chemical environment for artificial cells. From the perspective of computer science, these are embedded systems. They are special in allowing a novel form of evolvable hardware in which genetic information is shared between molecules and electronic memory. The feedback loop shown in the figure implements the strongly complementing version of the omega machine for PACE. For more information please visit the ECCell site. Here is the EU page for ECCell.